While we talk a lot about how we desperately need innovation, we seldom do what is required to make innovation a core competency in our organizations. Of course, there are a few famous exceptions. But, the fact that they are uncommon is a fundamental problem for the economy, society, and the natural environment. The American Society for Quality (ASQ) is doing something to help make innovation more common in all our organizations. In May of 2013 ASQ held an Innovation Think Tank (ITT) in Indianapolis to begin creating a “baseline of perspectives” on innovation from a diverse group of leaders and innovators from a wide variety of organizations and backgrounds. 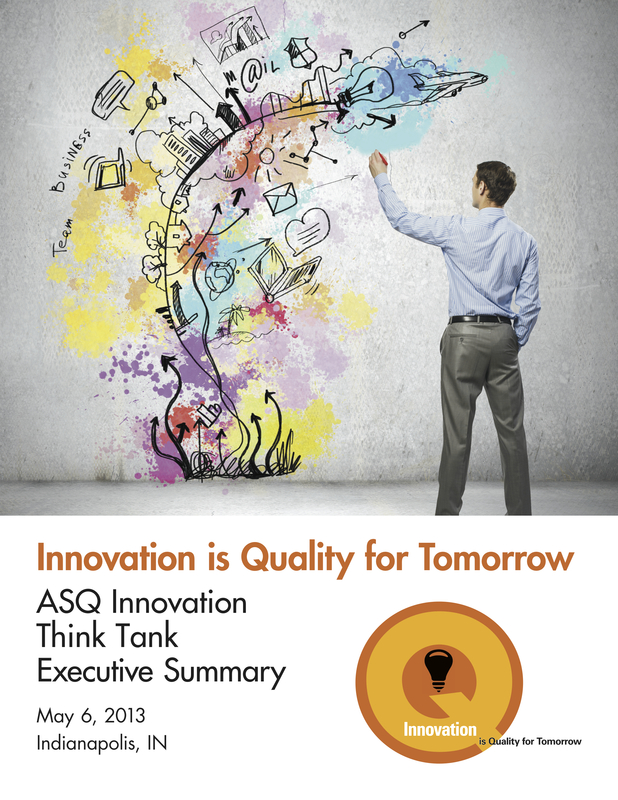 We covered many topics during the think tank and the results were further developed by member leaders from ASQ’s Innovation Interest Group and eventually published in an executive summary. According to the ITT Executive Summary, “seniors leaders desire rapid and breakthrough innovation to remain competitive and address complex organizational, social, and environmental issues” (ASQ, 2013, p. 2). But it won’t help if we improve on innovation only to lose our ability to execute. Organizations today must become ambidextrous. That is, they need to learn how to produce innovative AND high-quality products and services. This requires they develop the two essential competencies of excellence – strategy and execution. This, of course, is easier said than done. Innovation can be challenging by itself. To be good at both innovation and quality will require leaders overcome several challenges and rethink their leadership approach AND the design of their organizational systems and culture. The challenges to innovation are embedded in the three core dimensions of your organization: the people, the culture, and the systems. Your first challenge is to develop a team that is capable of innovation and quality. Given that not everyone is equally good at both, this can require one develop what the ITT Executive Summary describes as a “genius team” (See the Eight Critical Skills of the Innovator on p. 11). Your second challenge is to develop a culture of innovation and excellence. At the “heart” of culture are the values of the organization. Values cannot be observed directly. Instead, we are left inferring the values from the observable aspects of the organization including rituals, heroes, symbols, and practices (Hofstede, 1997). What do your organization’s cultural characteristics tell you about innovation in your organization? For more on innovation and culture see Section VII in the ITT Executive Summary. But, before you can change your organization, you will likely need to change yourself. In order to be credible, you will have to as Gandhi said, “become the change you want to see in the organization.” The ITT Executive Summary describes several characteristics that comprise the “Innovator’s Persona.” The ITT report also describes eight critical skills of the innovator (p. 11). I hope you will download and study the ITT Executive Summary and use it to improve innovation in your organization. As Deming is quoted as saying, “survival is optional, no one has to change” or in this case, innovate. Hofstede, G. (1997). Cultures and organizations: Software of the mind. New York: McGraw-Hill.